These sophisticated GPS/Chartplotters are supplied with built-in detailed charts for coastal navigation of the USA (including Alaska, Hawaii and Great Lakes), Canada, Bahamas, Caribbean, Cuba, Mexico, Puerto Rico, and Central America. It boasts a crisp 320x240 direct sunlight viewable 5-inch color TFT display and is supplied with a swivel bracket and flush mt. hardware. Achieve up to 10' accuracy with the integrated 50 channel WAAS GPS receiver or with the optional external GPS Smart antenna. Dedicated MARK, ROUTE and INFO keys allow for fumble free operation. To find fish, wrecks and record water temperature, simply connect the optional FF525 50/200kHz black box fish finder and transducer. In addition, the CP190i displays vessel positions when connected to a DSC radio and tracks AIS (Automatic Identification System) targets when connected to an optional AIS Receiver. C-Map NT+ and C-Map MAX compatible. Other features include 3000 marks, 50 routes, 20 tracks, 2 NMEA inputs and 3 outputs, and much more. 3-Year waterproof warranty. 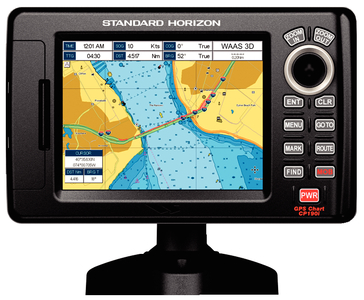 7.1" W x 4.4" H x 1.7" D.
The CPF190i model offers all the above GPS/Chartplotter features above and includes a built-in 600W 50/200 kHz dual-frequency fishfinder with 2x and 4x zoom, bottom lock, white line, speed capability, shallow/deep/temp alarms, and more. 7.1" W x 4.4" H x 2.3" D.